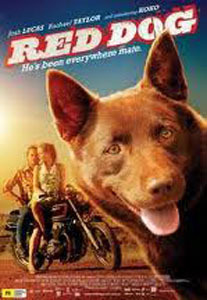 Have you seen Red Dog yet? If not I thoroughly recommend it, it is one of those movies that the Aussies do really well. Quirky and surprising and very real, not the Hollywood look at all. Not a nip or tuck in sight that’s for sure, I spotted two sets of even teeth in the whole movie and one of those belonged to the American star Josh Lucas, who was the leading man. The other set to Australian actor John Batchelor who plays Peeto, who also stars in the Underbelly series Razor. He is no oil painting by any stretch of the imagination but there is just something magical about him, he has that x-factor and just light up the screen. I love that about the Australian and British movies that people look like they do in real life, tall, skinny, short, fat, wrinkled and crooked teeth, young and old. The cast includes Noah and Rachel Taylor (no relation) as well as many other fine Aussie actors and even includes several people as extras from Mallala, Two Wells and Balaklava. So go to the movies prepared to both laugh and cry, because it certainly makes you feel and that is the whole reason for art isn’t it? Whether it’s looking at paintings or sculptures or seeing a movie or a play, you want to come away from the experience feeling something! This movie is guaranteed to do that. 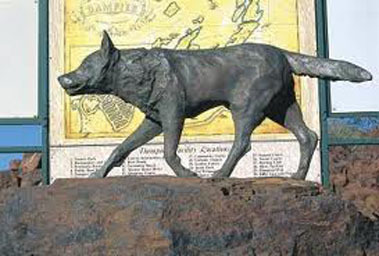 The story is about the famous” Red Dog” a Kelpie cattle dog cross, who roamed the countryside of the Western Australia’s Pilbara region, and rumour has it he even caught a ride on a ship to Japan. He had a couple of “masters” during his life time but was for the most part an independent wanderer who would hitch a ride with motorists by sitting in the middle of the road. It is said that Red was looking for his beloved “master” as he wandered from town to town looking into everyone’s faces as he searched far and wide. Red was the best friend to nearly the entire population of the mining town Dampier in the 1970’s and it was here he eventually returned. A bronze statue was erected in his honor after his death. Dampier and the statue will no doubt get a lot more visitors now that the movie has alerted us to its existence. Several books have been written about Red, however this movie is based on the book by British author Louis de Bernieres (author of Captain Corelli’s Mandolin which also was made into a film starring Nicolas Cage & Penelope Cruz). It certainly is a heartfelt movie superbly directed by Kriv Stender, which provides us with those ‘laugh out loud’ moments and is suitable for the whole family. Another ‘laugh out loud’ moment I would like to tell you about is from our darling dog Saba, or Ali Baba as I used to call her. 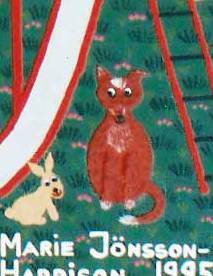 She is the red dog in the above painting a Red Heeler and shared our lives on the farm. My husband used to work away during the week and Saba would sleep in the ute during the night (as hotels are not too keen on the four legged variety of guest.) Anyway one day a packet of Kraft Cheese singles (cheese slices individually wrapped in plastic) was left on the dashboard of the car and when hubby let Saba out in the morning the cheese of course were long gone – packet and all. However a day later the Kraft Cheese reappeared in the grass although now they were curled up in the shape of pencils but otherwise still intact and still wrapped in plastic. You could theoretically uncurled it, taken off the plastic and eaten it again lol, not that we did mind you!